(1) 34067 replaced unavailable 48151. Rod Miebs comments: 48151 had used more and more oil in an axle box on its previous tour. She was replaced by 34067 for repairs to take place. (2) Banked from London Victoria to Grosvenor Bridge Jn by 37516. 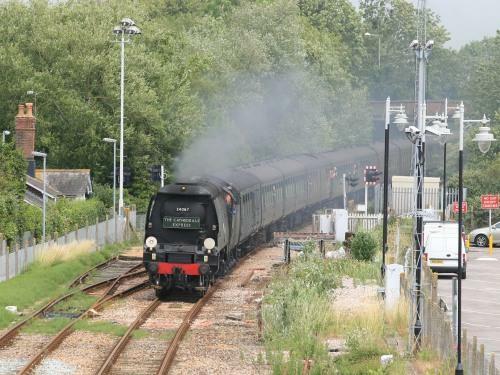 (3) Rod Miebs comments: I did not take timings, but the train ran to time up to the Frant water stop. This was extended by some 10 minutes. Control was kind, the train ran unchecked onward to Victoria. Grosvenor Bridge Jn 16/06 ? Stewarts Lane Jn 16.08 ~ 16.12 ? Grosvenor Bridge Jn 10.48 ~ 10.50 10.47 ~ ??.?? 15/33 ? Stewarts Lane Jn 10/55 [RVL] ? 15/33 ? Longhedge Jn 11/01 ? 15/22 ? Latchmere Jn 11/10 ? 15/11 ? Kensington Olympia 11/19 ? 15/05 ? North Pole Jn ? ? 15/00 ? Mitre Bridge Jn 11/25 ? 14/56 ? Willesden WL Jn 11/28 [DR] ? 14/54 ? Willesden No.7 11/30 [DR] ? 14/51 ? Wembley Yard South 11/35 ? 14/49 ? Wembley EFOC 11.40 ~ 11.48 ? 14.36 ~ 14.42 ? Wembley Yard South Jn 11/55 ? 14/31 ? Harlesden Jn 11/58 ? 14/27 ? Willesden Depot 12.00a ? 14.25d ? Note: later E.C.S. moves are shown on the Surrey Hills Midsummer's Evening Tour page.